It’s Friday night of the wedding weekend and Lily would be calling it a night if it weren’t for the ghost in her bedroom. In “No Questions Asked” the gang decides on another social rule that I wish my friends would follow. It’s literally the “no questions asked” rule, where the gang can ask a friend for a favour without the other person asking how they managed to get themselves stuck in a mailbox. Last week, Daphne sent Lily a text saying that Marshall accepted a judgeship, and this week Lily’s phone is on some sort of delay where she doesn’t get text messages until the most opportune time. 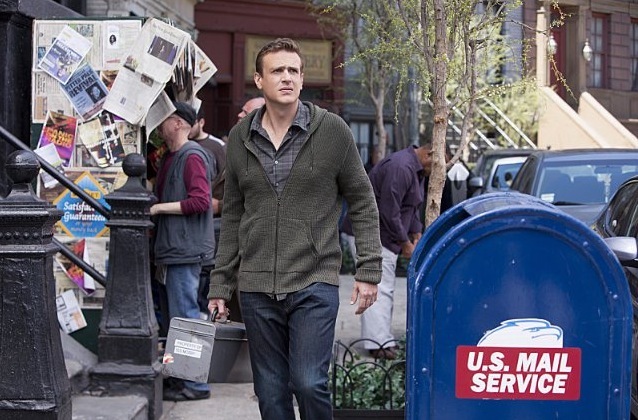 In order not to have a fight over the phone, Marshall cashes in his “no questions asked” with Barney, Robin, and Ted who find the most inconvenient ways to sneak into Lily’s room, even though her door doesn’t lock. In a Halloween like twist, Lily’s door doesn’t lock because she’s in room 13, an unkempt room in the hotel that uses the ghost of Captain Deerduff as an excuse for all it’s problems. Ted finds his way into Lily’s room by climbing the drain pipe with a coat hanger, scaring Lily into thinking the Captain is in her room. The drain pipe was a nice throw back to Victoria and Klaus’ wedding. Barney finds his way into Lily’s room through the drain pipe, and Robin later joins the boys after calling room service into Lily’s room. Barney’s there because he owes Marshall a “no questions asked” after picking him up from the hospital for swallowing life sized lucky-charmed items. Robin’s there because she is a ninja in a morph suit? She’s definitely something mysterious, since she carries her morph suit around and can change into it almost instantly. The three of them discover that Lily must have her phone on her, which leads them to run their separate ways. Barney and Robin realise that they, again, we’re going to “lone wolf” it, i.e., make plans without consulting the other. Since they can’t be lone wolves in a marriage, they hatch an elaborate scheme that, as Robin puts it, “it’s absolutely insane…how foolproof this plan is!” Of course, the plan is foiled all too quickly when Ted, after being Marshall’s ninth pick (does he even know six more people? ), throws away his “no questions asked with Lily and makes her throw down her phone and step on it. I find it hard to believe that a woman so attached to her phone as to carry it around with her in a night robe would just smash it on the ground. Let’s just say I’d have some questions. In the end, Marshall tells Lily that he accepted the judgeship anyway. I honestly thought Lily was going to be okay with it for a second, and then I remember she just broke her phone for no reason, so yeah, I’d be pretty annoyed too. There’s still no Mother, we’re a second week without James Stinson, and Marshall is still in the car with Daphne. I’m holding out hope that since Marshall has been in more and more flashback scenes with the gang, and it’s Friday night, that he’ll be here soon. I mean, they have to sleep at some point right? So maybe next week will be Saturday, and he can’t miss the rehearsal dinner, can he? The Mother still has four more people to meet, so can’t she meet just one? And can we have Wayne Brady back just because more Wayne is good for everybody?